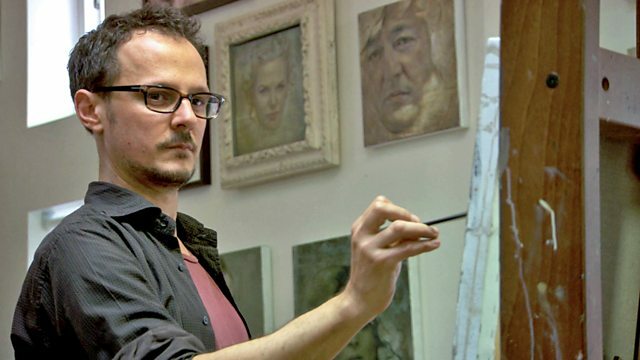 Alastair Sooke meets portrait artist Jonathan Yeo as he prepares for a solo show at the National Portrait Gallery. Yeo reveals the challenges of painting people for a living. Alastair Sooke meets portrait artist Jonathan Yeo as he prepares for a solo show at the National Portrait Gallery. The son of a Conservative MP, his subjects range from political leaders to Hollywood stars, including Nicole Kidman, Kevin Spacey, Damien Hirst and Tony Blair. In the lead-up to the exhibition, Yeo allows BBC cameras into his usually private studio, revealing the challenges and pleasures of painting people for a living, and the subtle dynamic that develops between artist and sitter. The programme features acclaimed British actor, Tom Hollander, as he sits for a portrait, and follows the progress of the canvas from the first brushstrokes to the final reveal.